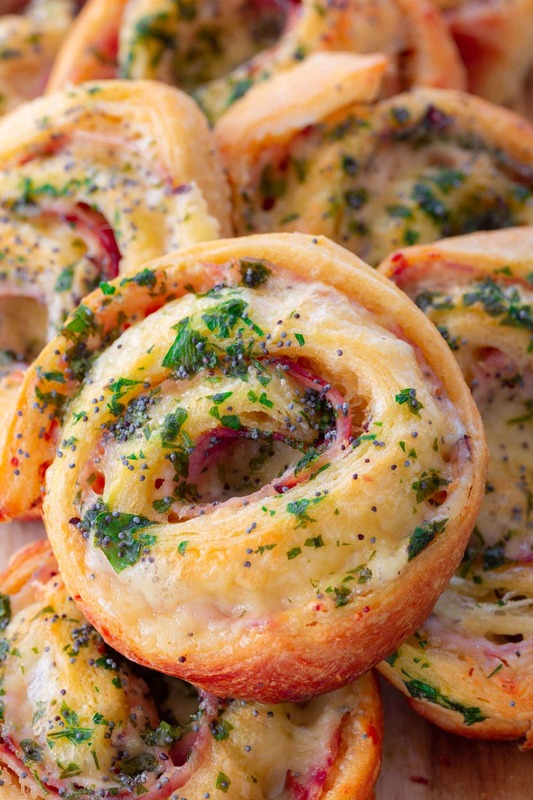 These Baked Ham and Cheese Pinwheels are the ultimate last-minute party snacks! Made with store-bought crescent dough and loaded with Dijon mayo, Black Forest ham and Gouda cheese. Forgot to plan a snack menu for this Super Bowl Sunday? Don’t fret! You still have time to pull off something amazing. One thing I have learned in adulthood, is to always have a few life saving ingredients in my fridge, just in case we end up hosting unexpected guests. Crescent dough is one of them, as there are so many different dishes I can make with it! Well, hopefully you have at least one kind of cheese. 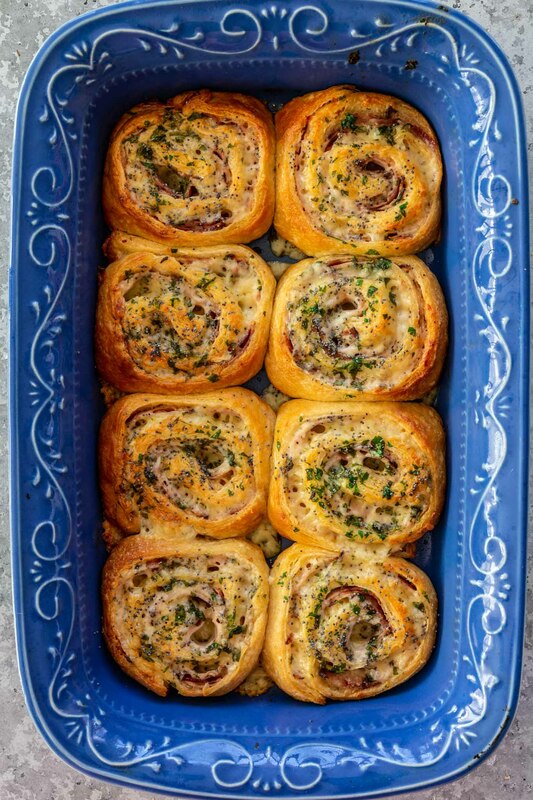 And that means you are halfway set to making these ham and cheese pinwheels and winning at last-minute entertaining! Easily customizable and ready in a snap! 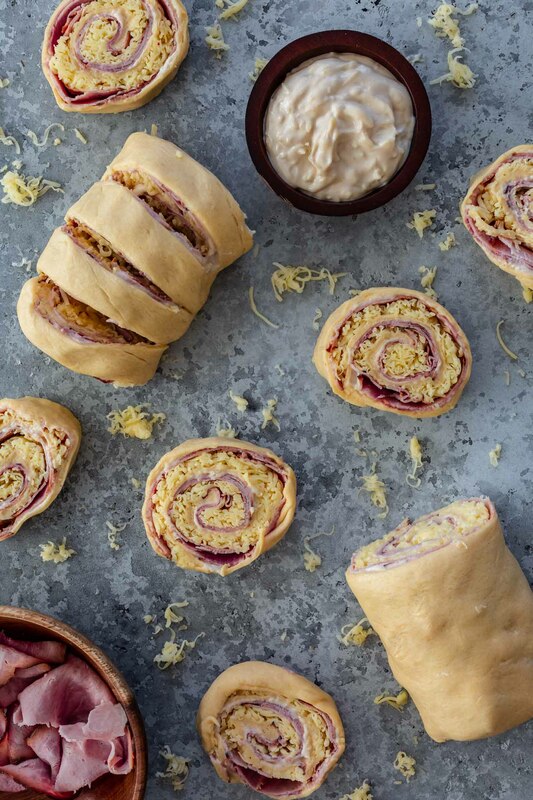 These pinwheels are so versatile that you can make them a million different ways. Want to use another kind of cheese? Turkey instead of ham? Roast beef? Go for it! 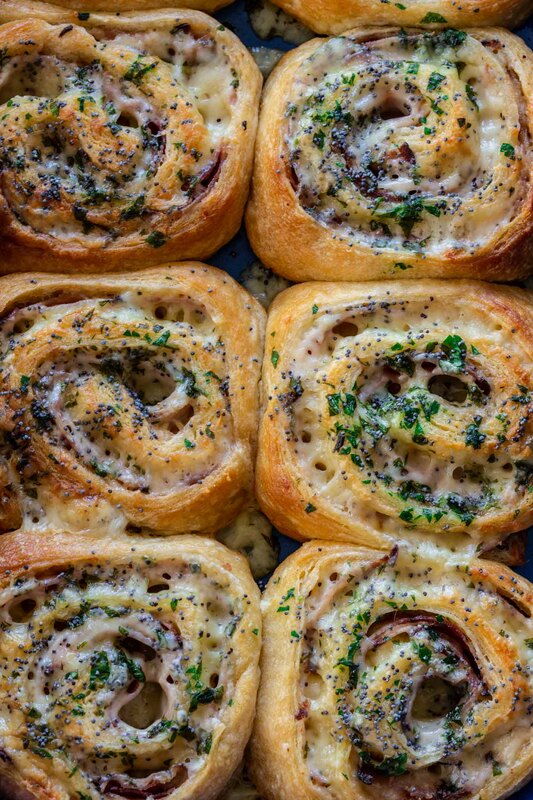 Wanna use puff pastry instead of crescent dough? Or perhaps homemade pizza dough? Be my guest! Think of the dough as a blank canvas and your fridge as an art supply closet. The sky is the limit! 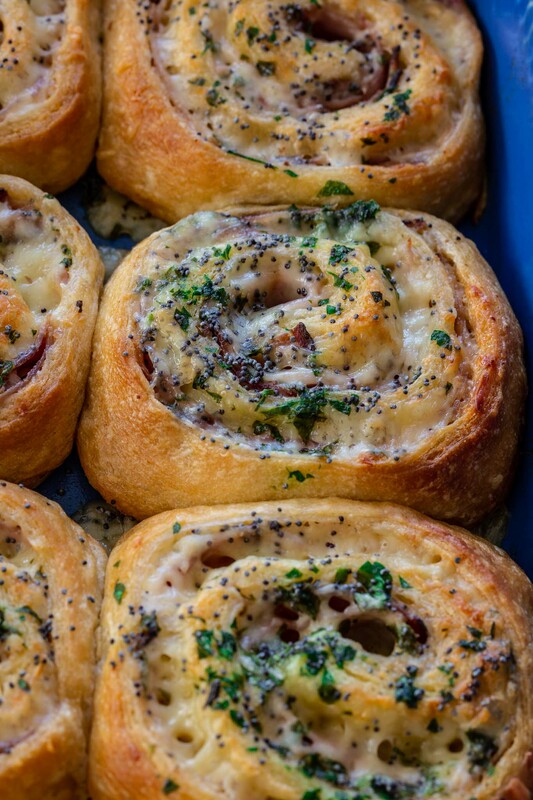 You can make Pizza Pinwheels, Bacon and Cream Cheese Pinwheels, Spinach Artichoke Dip Pinwheels, you name it! If you have the ingredients, you are on our way to snack nirvana. And you won’t have to wait long either! It will take less than 30 minutes between starting to make these and having them in your belly. Or your guests’, I guess… Although there is no shame in making a batch for yourself just because! You will only need 5 main ingredients! Crescent dough – homemade or store bought. If using store bought, try to find “crescent dough sheet” as that will eliminate the pinching the seams step. Cheese – I use Gouda because I love its creamy texture once melted! Black Forest Ham – My favorite kind of cooked ham. I love the smokiness and touch of sweetness, especially when paired with cheese. Dijon Mayo – Basically mayonnaise mixed with a little Dijon. I add a little Parmesan because I’m extra! Some people have a problem with hot mayo. If that’s you, just omit the mayo and spread only Dijon instead. Melted Butter – For brushing before baking. Optional toppings: poppy seeds and chopped parsley. 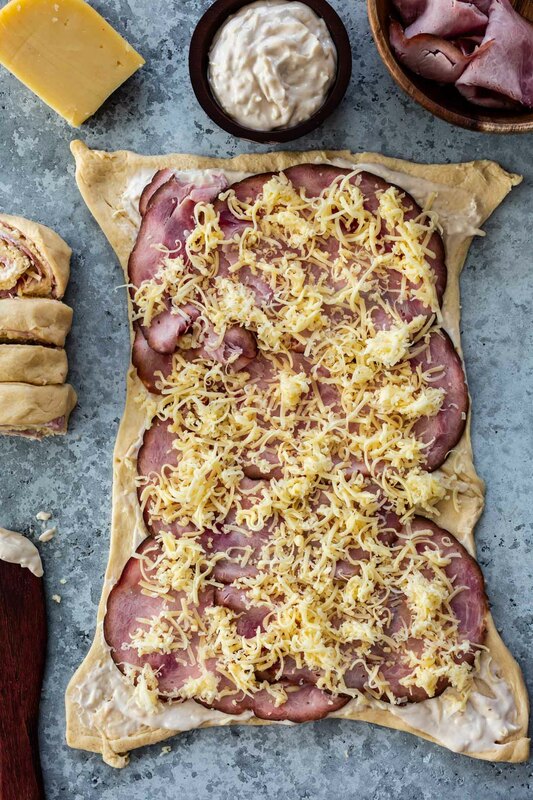 The “technique” involves unrolling the dough, spreading the Dijon mayo, topping with ham and cheese, and then tightly rolling up the dough like a roll cake. Cut into 1-inch thick slices, arrange in a baking dish, brush with melted butter, sprinkle the toppings and bake til perfection! Voila! Pinwheels are ready to be devoured. My recipe uses 2 sheets of dough to make 16 big pinwheels total, but I’ve made smaller ones before. When I want them bite-sized, I cut the sheet in 4 rectangles and roll each one into a smaller log. That will yield you around 12 small pinwheels per sheet. 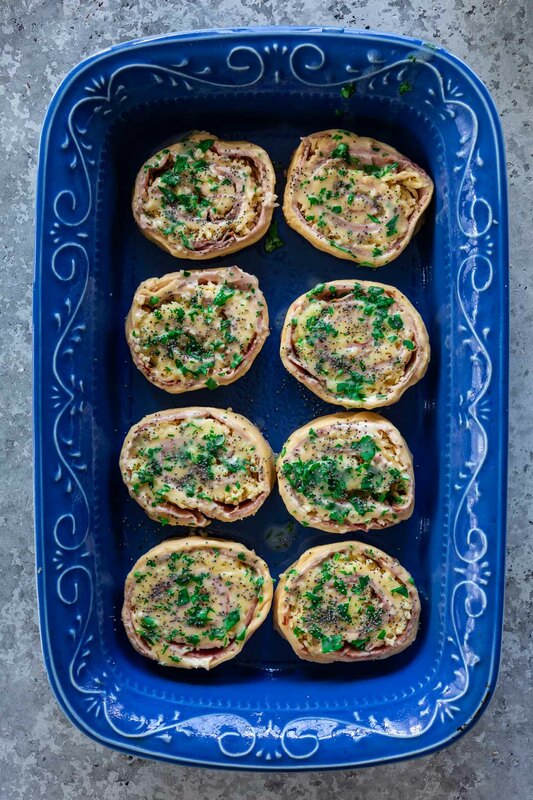 If you’re feeling fancy, and are into sweet and savory flavors, you can drizzle some honey on the ham and cheese pinwheels when they come out of the oven! A touch of sweetness pairs really well with the buttery flaky crust and the smokiness of the ham. Crescent dough is easier to handle while its cold. If it starts to get warm and soft, you might have trouble rolling it, so work quickly! I like to leave a 1/4-inch border on the edges, to prevent the filling from squeezing out when I roll. Use a sharp knife to cut the slices and don’t worry if they are not perfectly round. They will puff while baking so it doesn’t really matter! 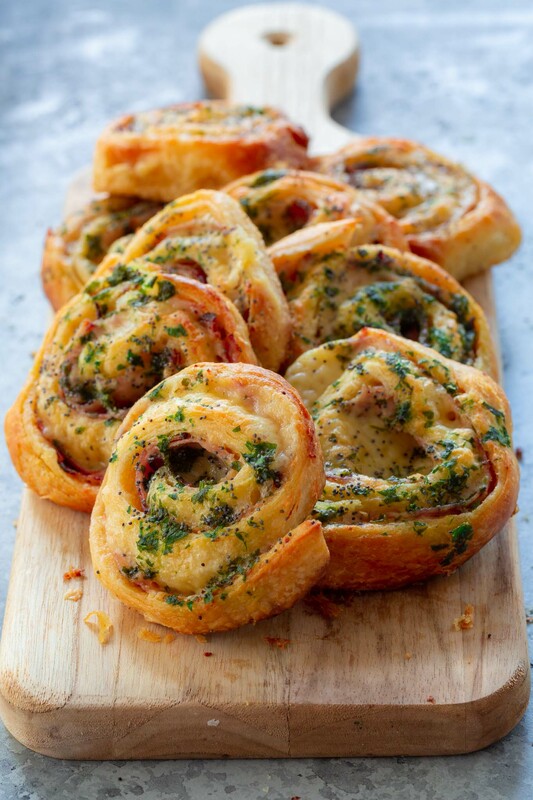 For crispier pinwheels, arrange them on a baking sheet and leave at least an one inch space between them. They will spread a little during baking and, if they touch, they won’t be as crispy. That being said, I sometimes like when they get all cozy together, like a monkey bread, resulting in a softer bite. If you are lucky enough to end up with leftovers, they reheat nicely in a 350 degree F oven. Just wrap them in foil and reheat for about 10 minutes, or until warm. If you don’t plan on eating leftovers within the next couple days, I advise you to freeze them. You can make these ahead, the night before. Just roll them up, wrap with plastic and refrigerate. When ready to serve, slice, arrange on sheet and bake. Easy peasy! Yes, you can! But you have to fully bake them and let them cool before freezing. I don’t advise freezing them unbaked as the dough loses its texture and the grated cheese can come loose. If you make these already planning on freezing, I would skip the mayo and just spread Dijon mustard instead. Mayo can separate when frozen and become grainy and watery. These are seriously one of my favorite snacks! So easy to make and with incredible disappearing power. They vanish within seconds in our house! It’s a great savory snack to chomp down while watching the big game! I hope you love it as much as we do. And stay tuned cause next week we’ll be switching the focus to Valentine’s Day goodies and cooking for two! Oh, I can’t wait! Preheat oven to 350 degrees and spray two large baking sheets with cooking spray. Reserve. Prepare the Dijon Mayo by combining the mayonnaise, Dijon mustard and parmesan in a bowl and mixing until smooth. Reserve. 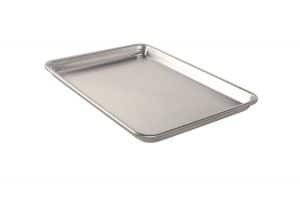 Unroll dough onto a large cutting board or on your counter, pressing into a 12X8-inch rectangle. If you are using the rolls, press the seams together to seal. Spread the Dijon mayo and top with ham and cheese, leaving a 1/4-inch border on the edges. Roll up tightly into a log, starting on the short end of the rectangle and seal the seam. Repeat with the second dough sheet. Cut each log into 8 slices, about 1-inch thick. Arrange them on the prepared baking sheet, leaving at least 1-inch space between them. Brush with melted butter and sprinkle the chopped parsley and poppy seeds.